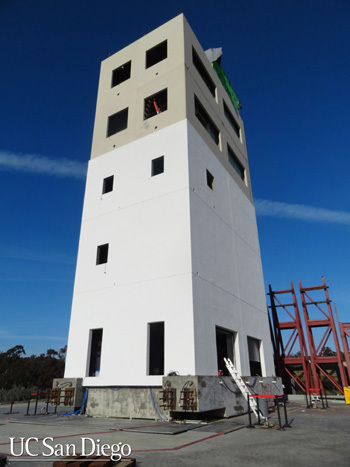 An overall shot of the five-story building that will be tested at the Englekirk Center at UC San Diego starting April 16. 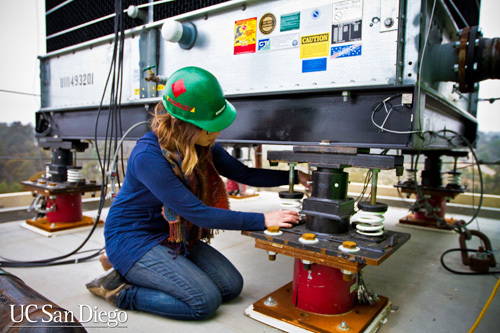 Structural engineers at the University of California, San Diego are about to find out during a two-week series of tests conducted on the world’s largest outdoor shake table at the Englekirk Structural Engineering Center. The overarching goal of the $5 million project, which is supported by a coalition of government agencies, foundations and industry partners, is to ascertain what needs to be done to make sure that high-value buildings, such as hospitals and data centers, remain operational after going through an earthquake. Researchers also will assess whether the building’s fire barriers have been affected by the shakes. Throughout the two weeks of testing, engineers will monitor the building’s performance with more than 500 high-fidelity sensors and more than 70cameras that will record the movement of key elements and components inside the building. “What we are doing is the equivalent of giving a building an EKG to see how it performs after an earthquake and a post-earthquake fire,” said Professor Tara Hutchinson of the Jacobs School of Engineering at UC San Diego, the project’s lead principal investigator. Hutchinson is working with a multi-disciplinary team of academics and industry representatives, including Jacobs School Professors Jose Restrepo and Joel Conte. Reporters are invited to witness two of the tests from 8:30 a.m. to noon April 17. Media is required to RSVP by noon April 16 to ipatrin@ucsd.edu or (858) 822-0899. Media that cannot attend can take part in a webcast from 11 a.m. to noon PDT April 17 that will include a broadcast of the tests and a Q&A with researchers. Contact media officer Josh Chamot at the National Science Foundation at (703) 292-7730 or jchamot@nsf.gov for the webcast participant passcode and phone number. This is the first time in the United States that tests focus on a broad range of nonstructural systems and equipment that can malfunction during an earthquake, such as a working elevator, stairs and a broad array of medical equipment. The tests also include modern ceiling systems, a heating and air conditioning system, functional sprinklers, computer servers, large and small laboratory equipment, and electrical equipment and wiring. Over the past three decades, the majority of losses caused by earthquakes can be attributed to damage to nonstructural elements such as these. The 80-foot-tall structure also is equipped with a large water tower and an air conditioning and heating unit on its roof. The exterior of the building is complete with heavy precast concrete cladding as well as synthetic stucco, each commonly used in commercial construction. This is also the first time that a base isolation system will be tested under a full-scale building on a shake table in the United States. The system is comprised of large cylindrical rubber bearings that isolate the five-story building from most of the lateral motion it would normally experience during a temblor. Similar systems have been used to retrofit the Los Angeles, Oakland and San Francisco city halls, among other structures. Base isolation also is used in new construction in the United States and is fairly widespread in Japan. The method is particularly useful for shorter, stiffer buildings rather than taller buildings such as high-rises. During the second week of testing, the base isolation bearings will be removed and the building’s foundation will be anchored directly on the shake table. This is the first time that a building will undergo fire testing after being put through a series of simulated seismic events. Researchers from UC San Diego and the department of fire protection engineering at the Worchester Polytechnic Institute will first study the performance of active and passive fire protection systems, which will provide insight into damage caused by earthquakes. Then, in May, engineers will conduct fire tests in the building, tracking temperatures and the movement of smoke to help gauge the potential for fire spread in an earthquake-damaged building. Detail illustrations and layout Zina Deretsky, National Science Foundation, Building illustrations UC San Diego Department of Structural Engineering. Researchers also hope to better understand what needs to be done to make sure medical centers remain operational after a temblor. The building’s top two floors are outfitted with a surgery suite and intensive care unit, two components of the project supported by the California Seismic Safety Commission, which investigates earthquakes and recommends to the governor and state legislature policies that will reduce earthquake risks. Likewise, the fire-related data will help engineers model the fire performance of buildings damaged in earthquakes. “Knowing how fire protection systems might fail in an earthquake, and how the fire and smoke might spread, will allow us to design more resilient systems and provide better protection to people, property and mission,” said Brian Meacham, associate professor of fire protection engineering at WPI. Graduate student Michelle Chen examines the anchors that attach a water tower to the roof of the building. Sensors will be placed strategically throughout the building to measure how components perform. For example, 230 accelerometers will measure how fast the building and its nonstructural components moved during the simulated temblors. In addition, 160 sensors, including high resolution GPS devices, will measure the relative displacement between two points, while 50 strain gauges will measure the deformation of the rebar that are buried in the building’s concrete foundations. About 80 cameras will be focused on the building, with most of these distributed within the interior of the building to monitor the nonstructural elements during the tests. The 1994, 6.7-magnitude Northridge earthquake. The 2002, 7.9-magnitude earthquake that took place in Denali, Alaska, these motions are similar to seismic events that could occur in Southern and Central California. The 2010, 8.8-magnitude earthquake in Chile and the 2007, 8.0-magnitude earthquake in Peru. The Chile and Peru events produced ground motions that could occur in the Cascadia subduction zone off of the coast of Northern California, in Crescent City and Eureka, for example. On April 17, the building will be subjected to motions recorded during the 1994 Northridge and 2010 Chile earthquakes. 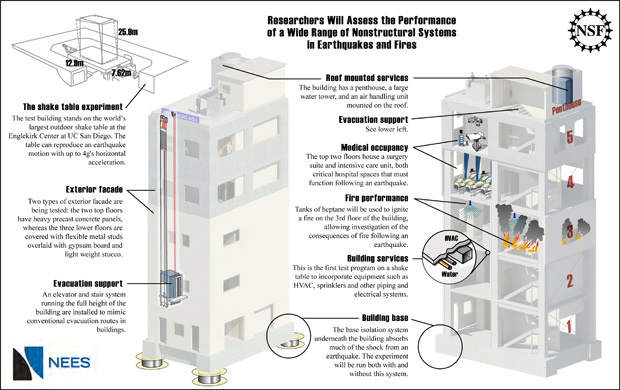 During this complex series, researchers also will be investigating the performance of nonstructural systems, which provide evacuation support for the occupants of a building. “In the 2011 Christchurch earthquake in New Zealand, and in other past earthquakes, stairs have failed in some buildings,” Restrepo pointed out. Scientists hope the tests will help find ways to keep elevators and stairs safe and functional after a major temblor. Other components of the project include computer servers and laboratory equipment on the third floor. The five-story building also is outfitted with two different kinds of façade: the two top floors consist of heavy, precast concrete panels, while the three lower floors are covered with flexible metal studs overlaid with gypsum board and light-weight stucco, with the studs constructed using a multi-floor spanning strategy known as a balloon framing. 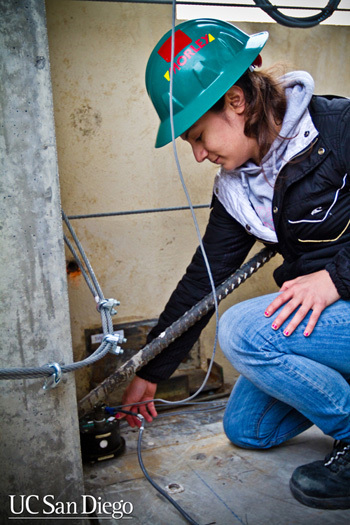 Graduate student Elide Pantoli checks one of the sensors installed on the five-story building to be tested starting April 16. During the seismic tests, researchers from WPI, led by Meacham, will regularly inspect passive fire protection components, including doors, ceiling systems, partition walls and fire resistant materials that seal openings in walls, to see how they are faring. If these systems are compromised, they could allow flames and smoke to spread and air to enter a room to feed a fire. They will also inspect the condition of active fire suppression systems, particularly sprinklers. In mid-May, following the two weeks of seismic testing, the WPI team will perform two days of fire testing on the third floor of the building. They will ignite pans of heptane, a liquid fuel that burns hot enough to simulate full burning within a closed space. Using sensors that record temperature and smoke movement, researchers will assess how damage from the simulated earthquakes affect the ability of the active and passive fire protection systems to contain fires and prevent the spread of smoke. Though fires that take place after earthquakes are a well-known and serious hazard, very little is known about the performance of fire protection systems in earthquakes, Meacham said. The data gathered through this research could help inform more effective fire codes. In addition, this study will provide a unique opportunity to simultaneously observe the effects of shaking and fire on building systems, which could lead to new multi-hazard computer models that could help architects and engineers design safer buildings. Meanwhile, Hutchinson, Restrepo, Conte and their colleagues will spend the following year analyzing data from the project before publishing their complete findings. The team also includes academic partners Ken Walsh of San Diego State University, Claudia Marin, of Howard University and Brian Meacham of Worcester Polytechnic University. The project is sponsored by the National Science Foundation, the Network for Earthquake Engineering Simulation, the California Seismic Safety Commission, the Charles Pankow Foundation, the Englekirk Advisory Board, the Society of Fire Protection Engineers and a large consortium of U.S. and international industry partners.